Agile project management methods are very helpful in complex fluid environments or where the requirements evolve or emerge during the lifetime of the project. The Agile approach avoids the sometimes cumbersome rigidity of ‘big design up-front’ and aims for ‘just enough design up front’. Prioritisation of requirements is used to then design and develop iteratively in fixed time cycles until the delivery date. This approach if used correctly can assure that the business benefit is maximised by delivering the most valuable/essential parts of the project on time and with the resources available. It will have been clear as the project progressed which elements of the project may not be delivered unless additional resource or time could be obtained. You can use agile approaches in combination with other methods such as PRINCE2 or PM Body of Knowledge without a duplication of effort. In the UK the DSDM Consortium leads the way in popularising and educating around standard Agile methods. So as we have with other ‘standards’ such as PRINCE2© and MSP® we have licensed content from them. You therefore work in an authentic environment, well aligned with the training and published materials. The Atern method contains much valuable material. Especially relevant are process diagrams and the full set of official Atern document templates. Although the templates are missing the inbuilt guidance. PIAB have also included additional templates and a separate set of basic guidance materials. Available now on all editions of PROJECT in a box. 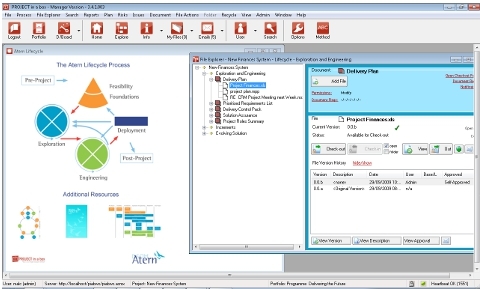 To see a video tour of the Atern method in Community Edition just follow the link – Atern in CE. If you like what you see you can download it for free here. Start your agile journey today. Keith Richards of the DSDM consortium has written an excellent book for the OGC on the topic of integrating PRINCE2 and Atern to get the best from both methods. We are not currently planning a fully merged PRINCE2 and DSDM Atern method template. PIAB supports personalised methods therefore you can do it yourselves if you want. You have the building blocks you would require and the book would be an excellent guide. PIAB 4 step and 5 step methods do have Agile aspects integrated with PRINCE2 templates. Therefore these prove to be apopular generic method choice.